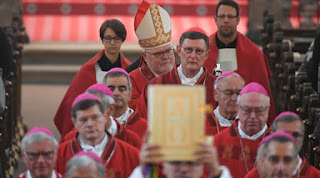 Marx for debate on ordination of "viri probati"
Even Pope Francis is already talking about it: Cardinal Reinhard Marx wants a broad debate on the ordination of married men. In this context, then another topic would be on the agenda. The chairman of the German Bishops' Conference, Cardinal Reinhard Marx, considers a discussion about new approaches to the priesthood legitimate. So the opportunity to ordain proven married men (viri probati) to priests, should be thoroughly thought out and discussed "over the whole range" of the problem, said Marx on Friday evening in Munich at the autumn assembly of the Regional Committee of Catholics in Bavaria. In a keynote speech, the Viennese pastoral theologian, Paul Zulehner expressed his conviction that Pope Francis will allow new forms of the priesthood. "We'll live to see it if no one shoots or poisons the pope." At the same time, the theologian called on Catholics to "step on the feet" of their bishops. It is "wrong to subordinate the celebration of the Eucharist to the celibacy of priests". Marx further explained that Pope Francis would talk to advisors about the ordination of married people. But it is not that there is a direct impulse from Rome to tackle the issue now. Therefore, he could "promise nothing" in this regard. The cardinal pointed out that in this context the women's question would come onto the table. But he sees "no movement". He had not heard so far from the Pope's commission of inquiry into female deacons. At the same time Marx affirmed experiments with new forms of church leadership. These would not only take place in his Archdiocese of Munich and Freising. But such models should not be tried oout without or against the priest. Nor does he think anything of priestless parishes, said the Cardinal. "Eucharists must be celebrated." In addition, no quality reductions should be accepted in ecclesiastical actions. "Where we act, it must be good." Those who only occasionally came into contact with the church expected that.